The HARDATA SMART+ is a High-End Channel-In-a-Box platform that provides interoperability among current and new technologies and products. 4 HD channel playout, 4 HD channel ingest and 1 4K channel in the same server. 2 versions available: SDI (4 HD SDI channels or 1 4K SDI channel) or IP (4 HD IP channels). You can upgrade from one version to another just changing the video card. Multiple HD channels IP-encapsulated. Support for IP transport protocols including ST 2022-6/7 and ST 2110. Plays and records video in 4K. Video over IP with current IP infrastructure. Connect to NDI inputs and make NDI outputs available to all your networked equipment. 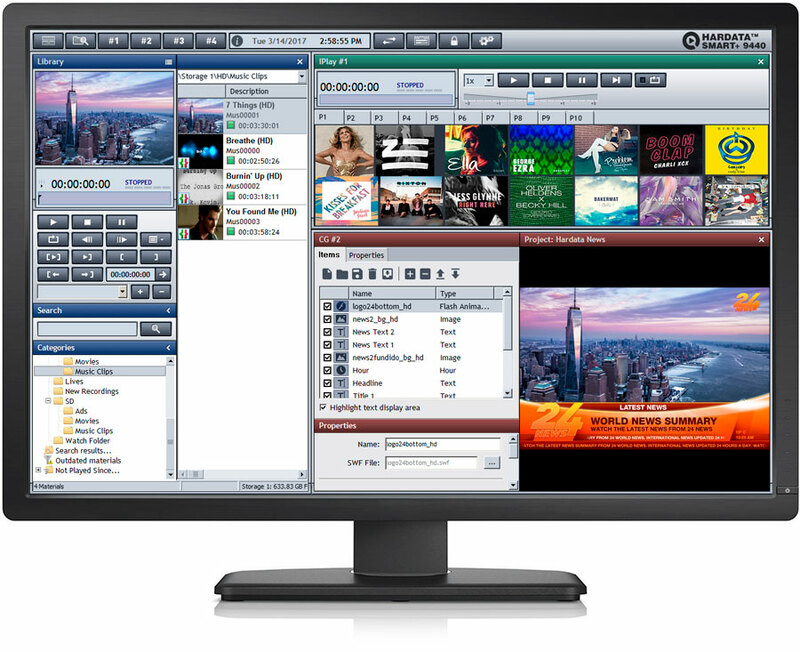 The Playlist can be operated manually or automatically, with Live Event insertions and commands for Graphics, Picture in Picture, GPI, Social Networks and more. The Playlist order can be changed on-the-fly. Ideal for live productions. It provides 10 pages of 20 buttons each, that can be assigned to any clip for instant replay. Ingest in SD and Full HD in Mpeg2 and H.264. Ingest in 4K in H.264. The TIME-DELAY can be set for each channel and has three modes, Censorship, Time-shift and Broadcast-delay. Real time, on-the-fly conversion of content between SD and HD. You can combine content from both formats on the same timeline. HD and SD simultaneous output. Manages both SD and HD content, adapting them to the output format to ensure safe, accurate and high quality playout. Ingest a live feed, add animated logos, graphics and text, or insert and replace advertising for error-free playout. CG allows insertion of graphics and animation – including time and temperature, external file text and metadata. A wide range of standard graphic file formats is supported. Including Latin, Greek, Cyrillic, Hebrew, Arabic, Chinese, Japanese, Korean, Vietnamese and more. It allows to playback a full screen video clip with transparency over the current video feed. This feature records continuously. You can cut and continue recording without losing a single frame. The clip is available for playing a few seconds after you start recording and does not need to wait until if finishes recording for playback. Subclips are sections of a video file. Each subclip hast its own metadata, code and entry and exit marks. It is possible to use subclips in order to sort and edit per cut large video files. Marks insertion with comments and tags, which are indexed to streamline and facilitate materials search. A monitoring tool for the SMART FLOW Ecosystem. Control the health of your equipments, the clips synchronism between the emission server and the Smart Flow, the transference and transcode of materials between the servers of the ecosystem, all from a centralized tool. Integrated into every HARDATA server for remote content management and reporting. Compatibility-tested on PC and Mac platforms, web access allows server imports and exports, video content preview, and broadcast report generation. Each storage array incorporates fault-tolerant hot-swap disks with RAID 6 technology and a built-in dual hot-swap power supply. Everything you need to be up and running in a flash. Easy to install, operate and maintain, it is operated through a simple, intuitive and user-friendly interface. You can be on-air in a matter of minutes. Ideal for advertising replacing environments on deferred broadcasts, to segment movies, series and news. It covers the entire workflow, from the continuous recording, the material production by creating subclips with different entry and exit points, cataloguing with marks, comments and tags and immediate Broadcast. You can do all this while recording the original material. With the use of a second playout server you can set up a MASTER/SLAVE conguration. With the SLAVE synchronized with the MASTER, all materials are copied and follow the playout list to generate a second video signal identical to the main one.